Broncos quarterback Joe Southwick was sent home from the Hawaii Bowl for "violating team rules." Boise State is dealing with dissension in the ranks in advance of its Hawaii Bowl matchup with Oregon State. The cause of the kerfuffle: An effort to figure out which Broncos player urinated off the balcony of the team’s hotel Thursday night. 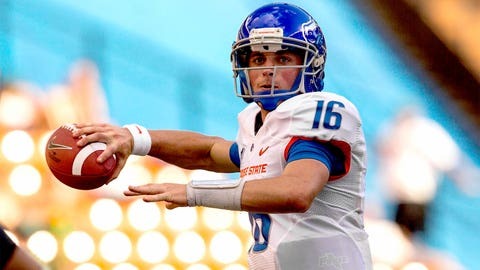 The starting QB for the first half of Boise State’s season, Joe Southwick, was the one accused of the misdeed and was sent home Friday. But he insisted to the Idaho Statesman that he was wrongfully accused. “The night it happened, I was out with the O-line, and then went in the ocean, signed in, and on the way up to my room, I stopped by someone’s room, and that’s when that whole thing went down,” Southwick told KTVB. “I witnessed the person who did it. The best part: Upon returning to Boise, Southwick took a polygraph test to prove he, in fact, did not pee off the balcony. "Really, this gives me a leg to stand on," Southwick told KTVB regarding the polygraph.